The most sweeping reform signed into law during the Newt Gingrich era as House Speaker was the 1996 Personal Responsibility and Work Opportunity Reconciliation Act -- popularly known as welfare reform. The landmark bill transformed welfare from entitlement to temporary safety net. Instead of welfare being available forever to any individual who met qualifying criteria, it was transformed to a time limited assistance program in which individuals had to also demonstrate their efforts to get to work. Democrats insisted during debate on the issue that the reform would push millions into poverty and then-Senate Democratic Minority leader Tom Daschle called the work requirements "extremist." Welfare reform was a resounding success. Welfare rolls plummeted by half and record numbers of young former welfare mothers found their way into the work force. Now that other major entitlement programs, Medicare and Medicaid, are up for scrutiny, the left wing is reacting as they did in welfare reform. Predicting nothing but gloom. A new ad produced by a left wing organization called the Agenda Project shows an elderly woman in a wheel chair being pushed over a cliff. The message: this is what Republican Medicare reform proposals will do to the nation's elderly. This is the sort of thing we expect from the left. As House Speaker, Newt helped lead welfare reform in 1996. He dubbed the then new Republican majority in congress the "Republican Revolution" and Newt then sounded like a genuine warrior for change. But what has happed to that change warrior of the nineties? Republican Newt Gingrich of 2011 sounds like Democrat Tom Daschle of 1996 as he calls the reforms of Medicare proposed by Rep. Paul Ryan, R-Wisc., "radical" and "right wing social engineering." Is Gingrich a different man today than he was in 1996? Although Medicare is a considerably larger program than welfare, the scope of reforms of Medicare that Ryan is proposing is no more revolutionary than the reforms of welfare that Newt enthusiastically embraced in 1996. Even more, the principles by which Ryan has proposed to reform Medicare are the same principles by which we reformed welfare. That is, bureaucratic social engineering is replaced by personal responsibility and market based incentives. I would argue that Newt 2011 is the same man as Newt 1996 and understanding why helps us understand why we need a new, different kind of political leadership today. The huge fiscal problems with Medicare, Medicaid, and Social Security are not new. They were well known in 1996. The archives on websites of think tanks like Heritage Foundation and Cato Institute can provide to any interested party reams of research papers going back 20 years explaining the crisis in these various entitlements programs. Yet they were ignored by both parties. Newt's "Republican Revolution" was not revolutionary enough to work on reforms of entitlements programs. The inaction, I'm sorry to say, was more an absence of courage than an absence of information. And it's why the Republican Party steadily went down hill. Why were Newt and congressional Republicans so bold with reforming welfare but nothing else? It was relatively easy. It's much easier to reform a program where the prime beneficiaries are poor black women than a program where the beneficiaries are every working American adult. Polls showed high support for reforming welfare. But polling shows far less public enthusiasm for Ryan's Medicare reform. But public skepticism comes from lack of knowledge. It's why Ryan is the kind of leader we need today. Someone who is in politics to do something rather than to be somebody. Someone with courage to see the truth, tell it, and help fellow Americans understand it. 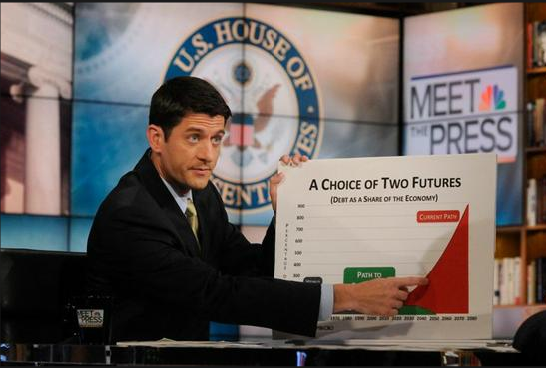 The Ryan plan restores freedom, ownership, and personal responsibility to center stage of entitlement reform. Exactly what we need.